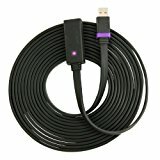 Nyko Extend Link for Kinect - ..
Nyko 743840860815 86081 15 Fee..
Extra-long 15 foot cable ideal for custom installations Soft flat cable for tangle free installation CE certified quality cable LED Link indicator Longest extension cable available for the Kinect without sacrificing performance Extra long 15 foot cable is ideal for custom installations Make installing your Kinect Sensor in your home theater a breeze with the Extend Link from Nyko Technologies. 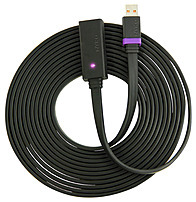 The Extend Link is a 15 foot extension cable for your Kinect Sensor to easily allow you to connect the Kinect to your Xbox 360 console. The extra length is ideal for users with wall mounted TVs, projectors or any set up that has the console at a distance from the TV. The flat cable design of the Extend Link is tangle free and made to make installation as easy as possible. The LED Link indicator glows to let you know a solid link is established between the Extend Link and the Kinect to easily trouble shoot any issues. I was very skeptical before buying this wire. However, my kinect with my projector is working excellently without any lag. This is the only 15 feet wire available in the market. No more problem for using my kinect with my projector. This has the Kinect customized USB port and NOT the standard flat USB connector. If you have bought Kinect bundle (Xbox and Kinect) then this is what you will need.